community we may look to bring back a civic ceremony.” He said all the organisations involved including the RSA were consulted before making the decision. 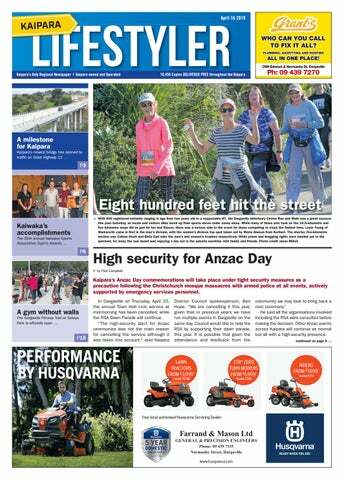 Other Anzac events across Kaipara will continue as normal but all with a high-security presence. 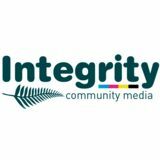 Opinions expressed in this publication and in advertising inserts, by contributors or advertisers, are not necessarily those of Integrity Community Media. All inserts delivered with the publication are not produced by Integrity Community Media. Audited distribution details Print run 10,450. Distributed on Tuesday to every residential and rural home throughout the district including Dargaville, Ruawai, Paparoa, Matakohe, Maungaturoto, Kaiwaka, Mangawhai and Wellsford. p Kids from Dargaville got a taste of the world’s most widely followed team sport this week, as Junior Football Day kicked off at Sportsville. A joint effort brought to life by the Northern Wairoa Primary Schools Sports Association, Northern Football Federation, Dargaville Football Club and Sport Northland. The day was a celebration of the ‘beautiful game’ of soccer. A big thank you goes out to all seven schools who participated, and the more than 50 teams who took to the field. Special thanks, too, to Dargaville Veterinary Centre for sponsoring the event as well as Dargaville High School Students for refereeing the games. p This unique photo is a piece of Dargaville history, brought to our attention by local resident Bill Berridge. A snapshot of the Northern Wairoa River on a millpond-calm day, this image clearly shows the historic Commercial Hotel to the far left, with the centre of the frame dominated by the milk factory where Mr Berridge’s father was a manager for three decades. Upon the hill, a lone pine stands sentinel where today the Dargaville Museum is situated. In the time this photo was taken, the view across the river to the milk company wharf would have been a familiar one for sailors transporting the produce of local farms by water. p The Kaipara Hunting and Fishing Club held its annual Duck Hunters Claybird Shoot on Sunday, which provided an opportunity to safely get target practice before the opening of duck shooting season. “Our club has been running for 23 years in the Paparoa area, and this event saw 50 people attend. It was an 80 clay target course with prizes donated by our valued sponsors,” says club secretary Annette Pull. “It was a simulated field shoot, which means clay targets can be thrown from any direction from six stands. Newcomer Rex Orton recently moved to the area from Auckland and took out the major spot prize, so I am sure we will see him again. A great day was had by all.”Paul Dunnett placed first hitting 75 out of 80 clay targets, second was Hayden Smith and Andy Thompson came third. The Local Government Commission has endorsed a Kaipara District Council proposal on local body elections for boundary adjustments and the establishment of a new Kaiwaka — Mangawhai ward. Kaipara’s newest bridge has opened to traffic on State Highway 12 completing the last link in the multimillion-dollar Matakohe deviation and bridges project. The two-lane Te Piringa Tahi bridge — which means ‘bringing together as one’ — is 191 metres long and stands 15 metres above the Matakohe River. It has six spans, each made up of five concrete supertee beams and is Northland’s longest supertee bridge, replacing the old wooden one-lane Hardies Bridge. Already open was the two-lane bridge at the western end of the deviation that’s replaced the old Anderson Bridge. Te Ao Marama Hou — which effectively translates to ‘moving from the past into the future’ — is 54.8m long and spans Parerau Stream. The two new bridges and 2.5km road realignment removes tight curves and short straights to improve safety on this section of the Twin Coast Discovery Route. You can arrange a time to visit us by contacting our Care Home Manager, Honey Marsh on (09) 439 6367 and you're always welcome to drop in and see us during normal business hours for a chat. SOMETHING FOR EVERYONE THESE SCHOOL HOLIDAYS! Youngsters take to the stage Otamatea Repertory Theatre has been a hive of activity for the past couple of months, as our young members have been rehearsing Disney’s Beauty and the Beast Jnr. Ruawai RSA 10.30am Contact Alec Stewart – 09 439 2737 Dargaville RSA Cemetery Dawn Parade – assemble at 5.45am Contact Ross Newlove 09 439 7492 This year Council has decided to provide support to the RSA for the Dawn Parade and not have a Dargaville Civic Service. This decision has been discussed with a variety of groups and will be reviewed in future years. prince trapped under a spell. To break the spell, the Beast must learn to love another and earn her love in return — before time runs out. The show features classic songs from the Academy Award-winning film score such as Be Our Guest and Belle, as well as original songs from the 1994 Tonynominated Broadway musical. There will be eight shows from Saturday, April 27 at 2pm and 6pm, staged through to May 5. Tickets are available at ort.org.nz or Tony’s Lotto Shop in Maungaturoto. A family special is available for the first show only. Either visit Tony’s or contact Maura Flower 022 354 2670 to secure your discounted tickets. Originally Produced by Disney Theatrical Productions Licensed exclusively by Music Theatre International (Australasia). All performance materials supplied by Hal Leonard Australia. We recommend and use genuine parts. AUTHORISED TOYOTA & ISUZU PARTS SUPPLIER. 1.8 Auto, NZ new, A/C, Electric windows. Towbar, TV, Fridge, Gas oven, 3 element, Sink, Shower, Toilet, Pantry, Hot & Cold water. FOUR WARDS FOR KAIPARA DISTRICT Over the last year Council have been undertaking a Representation Review. This looks at the wards, their boundaries, and names etc for the upcoming election. The council’s final proposal of 4 wards (an additional Kaiwaka-Managwhai ward) and no community boards was appealed by a small number in the community, and on 14 March 2019 the Mayor presented to the Local Government Commission (LGC) hearing on the council’s process and logic. The LGC has made their determination on our review and has endorsed the council’s final proposal of four wards with two councillors from each ward, and no community boards. This will take effect for the election being held in October 2019. Information on our representation review process can be found on our website www.kaipara.govt.nz/repreview Below is a basic map of the confirmed new wards in Kaipara. Council offices will be closed over Easter Weekend (Friday 19 April to Monday 22 April inclusive) and closed ANZAC Day Thursday 25 April. Our 0800 727 059 number is available 24 hours through this time. Thank you for your co-operation as these projects to improve travel on your roads are being completed. Please feel free to contact the Council’s Customer Service Representatives on 0800 727 059 for more information. after a long spell of dry weather. Fire and Emergency New Zealand has also lifted fire restrictions in Kaipara to ‘no permit’ status. Nestled in the heart of the valley you will find this much loved lifestyle block containing approximately 19.8 hectares (subject to title) with a charming Kauri Villa. The spacious 1900’s home has four bedrooms plus an office, the original kitchen is quaint, open plan with the dining area featuring a potbelly stove. The large family sized living room is heated by a fireplace which leads onto a further formal dining area. The renovated bathroom is modern and has a separate toilet. A covered outdoor space with clear blinds extends the living and the in ground spa pool is privately set. Infrastructure includes a self-contained sleep out in need of some TLC, a three bay garage plus another four bay shed to the top of the property. The land is subdivided into eight paddocks with good fencing, water is sourced from dam and the contour is easy to rolling. Set date of sale unless sold prior, plus GST if any. STOCK CLEARANCE - ONE DAY ONLY! • MACROCARPA SLEEPERS • BEAMS • STAKES • BATTONS • SLABS • LANDSCAPE TIMBER • 50% OFF PACKETS OF TANALISED PINE GRADE 2 GARDEN MULCH SPECIAL @ $25+GST PER METRE. BRING A TRAILER! FREE SAUSAGE Ph: 09 431 4363 www.treetrimmers.co.nz SIZZLE! more than enough for a police raid — right? My second issue that this is an important issue and one deserving of respect and consideration. What it didn’t deserve, what no legislation deserves or should have, is to be rushed through with a one-day sitting of a select committee ‘in the heat of the moment’. It is complex, it affects many people, and it doesn’t specifically address the gangs. Whilst I agree with the immediate banning of the sale of these weapons, the recall of those already out there will take time. The government could have used that time to draft more robust and less confusing legislation. What they have done, however, in this knee-jerk action, is set a dangerous precedent that goes to the core of our legislative process, and that is where I have a real concern. This holiday’s StoryWalk® features Stomp by New Zealand author Ruth Paul. A StoryWalk® is a picture book set up for you to follow the pages, reading a story as you stroll the gardens. This can be walked any time the park is open between 11am Monday 15 April to 3pm Friday 25 April. The library will host a guided walk 10.30am Wednesday 17 & 24 April, weather permitting. YOUR CONTRIBUTION DIRECTLY SUPPORTS THE ELECTRICITY RESCUE HELICOPTERS OF NORTHLAND, A SERVICE MANAGED BY NORTHLAND EMERGENCY SERVICES TRUST. HELP KEEP OUR EMERGENCY RESCUE HELICOPTERS IN THE AIR, SUPPLYING AIR AMBULANCE SERVICES, MEDICAL FLIGHTS AND SEARCH AND RESCUE SERVICES TO NORTHLAND. DARGAVILLE 17 Montgomery Avenue Loads of Room for the Family Not many houses have this many bedrooms. Five doubles and one single bedroom all with great storage - in fact, great storage all through the house over split levels. Good size lounge with log burner and doors to patio, opens to open plan dining and a nice modern kitchen. Two bathrooms. This home will accommodate large families and room for more. Double garage with internal access and carport. A large 1171sqm section in a quiet street. Kevin Tebbutt of Waipu and his daughter Natalia are travelling around Northland in a green GMC truck named The Dump Truck to start people talking about mental health and suicide awareness. Kevin says the idea arose after viewing a documentary about suicide titled Jessica’s Tree in early March. “This was my first positive thought for the year, but it was just about putting stickers on cars that was to say Jessica’s Tree after watching the video online that night. After a phone conversation with Natalia, all I wanted to do was create people talking and listening — by midday it had manifested into The Dump Truck with Natalia’s help,” said Kevin. The concept behind The Dump Truck is to get people talking about mental health and if people lost someone to suicide to write their name on the truck. “There are about 70 names on the truck already. We encourage people to sign their name if they have suffered from depression, anxiety, etc. If you have lost someone to suicide write their name with a RIP.” Carried on the truck’s tray is a green casket where people can write down their story or their thoughts and leave it inside. Kevin says these will never be read but instead the casket will be cremated. You Want Local Operators? We Are You Want Satisfaction? You Want The Best? Just give us a call, we remove it all! IF YOU NEED TO FIX IT, JUST MAKE THE CALL! WE’RE ON CALL FOR ALL YOUR PLUMBING NEEDS THIS HOLIDAY SEASON. BOOK YOUR CHIMNEY SWEEP NOW — BEFORE WINTER! Available directly from our Yard we can supply and deliver, or supply only. You can also place orders directly through your own Dargaville Carters or ITM account. Tackle those Autumn outdoor chores this Easter! The Dargaville Fitness Trail at Selwyn Park is officially open after a two-year process, which has seen three fitness trail stations constructed. “As we were securing the fitness gear to the concrete, the kids were already playing on it!” says Dargaville Lions President, Brian Nesbit, after Kaumatua Rex Nathan blessed the facility and officially opened by Dargaville Mayor Dr Jason Smith. The fitness trail has been very popular with both young and old, and many groups are now using it regularly. The latest set of equipment is a nine-station outdoor fitness hub. It’s something very new to Dargaville and has been very well received by the community, adding to existing monkey bars, chin-up bars, a sit-up and press-up bench, balance beams, parallel bars and a two-metre wall. All three stations are approximately 400 metres apart, so patrons can run, walk or even cycle between them for more aerobic activity. Future plans are to connect these with a shared path for running, walking and cycling. HOLIDAY SALE! Look for the RED DOT - and save 20% off marked items 15-27 April - DON’T MISS OUT! We will be open during Easter Break. CLOSED STAT DAYS ONLY. FOR ALL YOUR AUTO ELECTRICAL NEEDS CALL US TODAY! WE’RE HERE TO HELP YOU THIS EASTER! CALL US FOR ALL YOUR SERVICING, REPAIR & AUTO ELECTRICAL NEEDS DURING THE HOLIDAY PERIOD. Please stop by and see us from April 28th when we will be open once again to help you make your home look and feel amazing for winter! CALL NOW FOR A NO OBLIGATION FREE QUOTE! Norfolk Court People Living Healthy Happy Lives. Closed Easter Friday & Sunday. Let us tame that overgrowth and foliage before winter storms strike. A professional, tidy result will have your garden looking great and ready for the new season. that what they do brings quality of life to all their friends and neighbours who call Norfolk Court home. Favourite songs are requested time and again; sometimes the right story, poem or tune can unlock a memory which was almost forgotten. Secondly, it’s rewarding, educational, revelatory to hear about the past, about lives which are often extraordinary and times which, here, live outside of history books. Norfolk Court offers caring and safe home, where the persons dignity is maintained and profound respect is shown. While encouraging people’s independence and involvement in decision making. FEATURES ∙ Rest home, hospital and specialist dementia care in a caring and homely atmosphere. ∙ Permanent care, respite, carer support, day care and palliative care. ∙ Care, comfort, companionship and security, personalised rooms with pictures, photos, furniture and ornaments. ∙ A purpose-built single level facility with carpeted and vinyl floors, high ceilings with sky domes for good natural light and ventilation. HEALTH & MEDICAL SERVICES ∙ 24 hour registered nurse and qualified caregiver staff with specialist aged care training. ∙ Weekly doctor clinic and 24 hour on call GP and ambulance services. COMMUNITY OUTINGS AND TRANSPORT A 12 seater van and a specialised double wheelchair hoist van allow safe and comfortable transport for all residents. HOSPITAL CARE 35 bed hospital wing with independent dining and lounge area. SPECIALIST DEMENTIA CARE Norfolk Haven is a 15 bed specialist dementia care unit — a secure facility within Norfolk Court, providing a safe and homelike environment for residents with advanced Alzheimer’s or other dementia conditions. SPECIALIST SPORTS STORE SINCE 1985 ALL THE POWER YOU NEED IN THE FIELD, OFF ROAD... AND IN THE WORKSHOP TO KEEP YOU MOVING. CLOSED STAT DAYS ONLY OVER THE EASTER ANZAC BREAK. DARGAVILLE • Companion animal & pet clinic now open. • Experienced vets ready to help you. • Comprehensive farm animal & livestock service. KOOLZ KAI Fully Seated, Whanau friendly Restaurant. OPEN NOW Huge new menu. Visit us for Easter. Bookings essential! Fresh Fish. Smoked Seafood. Kina. Kaipara Flounder. Northland Snapper. Fish & Chips. Burgers. Raw Fish. Seafood Chowder. COME AND VISIT US THIS HOLIDAY SEASON FOR ALL THIS AND MUCH, MUCH MORE. Fully licensed restaurant, delicious menu and historic dining room. Minis in motion for charity When Geoff Murphy started filming breakout road-movie hit Goodbye Pork Pie back in 1979, he had no way of knowing that his fun-fueled caper traversing the length of New Zealand was going to become a classic. that works to help underprivileged Kiwi children get a good start in life. The Mini has a special place in the Pork Pie mythos, not just in the original, but in the 2017 remake. So who better to support this odyssey of superhatchbacks than our local small-car specialists, the team of John and Helen at Hatchback Haven? They’re throwing their weight behind Team Hillsbillies for this year’s epic trek from one end of the nation to the other, from Friday, April 19 to Wednesday, April 24. Minis from the Kaipara have been a big part of the field for each of the six times the event has hit the highways. We TICK ALL THE BOXES FOR AUTUMN MAINTENANCE SECURITY SORTED! With our comprehensive locksmithing & key cutting services. BE SAFE. BE SURE. SERVICE NOW! Cold conditions, wet and muddy roads. Is your vehicle up to the test? It’s time to replace worn wiper blades, steering & suspension or have your lights and batteries checked. See us now to face winter with confidence. PRUNING & FIREWOOD SORTED! With axes, log splitters & a huge range of Husqvarna chainsaws. RUST PROOFING & REPAIRS SORTED! With tools, lubricants, rust treatments and more. PH: 09 439 6377 BOOK NOW! With the commemoration of their 75th birthday coming up in August next year, and plans afoot to celebrate the centenary of New Zealand’s first airmail flight, you could safely assume that the history of Dargaville’s link to the water is on the minds of boating club members as they prepare for their annual Easter regatta. The big event, which draws vessels and sailors from around the largest harbour in the Southern Hemisphere, is as much about the future as about the past. With a longer than usual holiday on the calendar, this may prove to be the biggest regatta in recent times, with plenty to see from onshore as boats of all sizes square off in a series of friendly competitions. As in previous years, it’s not just the power and speed of each craft, which takes the trophy; it’s the skill of the crew reading the capricious waters of the Northern Wairoa, and being clever enough to match their times around the course. Of course, the expanse of water where this recreational run takes place was once a thriving hub of river commerce. In the days of tall ships and kauri mills, the muddy waters in sight of Dargaville sometimes resembled a forest of masts. Now, the river links the town to the ocean via the great Kaipara Harbour, a drawcard for anglers and those who seek an active, outdoor life after leaving the city. Thus, the appeal of having a river and a thriving boating club in the heart of town looks like being a positive point for the future, just as it was in our colonial past. www.hatchbackhaven.co.nz 997 Otaika Valley Road, Maungatapere JUST 7 MINUTES FROM WHANGAREI HOSPITAL! Over 30 cars in our yard. $12,995 +orc 2011 TOYOTA VITZ 1.3ltr Auto, New shape, ABS, Air/con, Alarm, Reversing Camera, 35,000kms. 1.5L, Auto, 50,000kms, Eco & EV Mode, Isofix, 6* Fuel rating. 1.5L, Auto, 16” Alloys, AM/FM CD Aux, High seat entry, Rear folding seats. 1.5L, Auto, Tiptronic, 15” Alloys, Rear folding seats, 5* fuel rating. 1.3L, Auto, High seat entry, Large cargo area, 5* fuel rating, (4 on Yard). C A S Insert the missing letters A C to complete ten words E the N — five across grid I and five down.C L More than one solution T L S may be possible. PRICES VALID MON 15TH – TUES 30TH APRIL 2019. All specials may not be available in some stores. No Trade Sales. Otamatea Community Services — Free Shopping Trips leaving 9.30am to Whangarei every fourth Wednesday. Phone 09 431 9080 to book. Kaiwaka Scottish Country Dance Club – Kaiwaka War Memorial Hall, Wednesdays 10am–noon. Teacher: Elaine 027 432 0032 Secretary: Megan 021 275 3007. Mangawhai Bowling Club – Housie/Bingo held every Friday at the Mangawhai Club. Contact Jan 09 423 9511 or 09 431 5371. Mangawhai Writers Group – Meets every second week from the first Thursday of the month. Contact Bevan 027 617 6521. Dargaville Riverside Market — Corner Totara and Kapia Street, Thursdays noon–4pm, phone 021 549 427 or see us on Facebook. Mangawhai Village Market — Every Saturday by the Village Hall, 9am–1pm. Contact Marita for details 021 598 917. Dargaville Monthly Market — 1st Saturday of the month, Community Hall, Hokianga Road, opposite Dargaville Town Hall. $5 per table — book now 09 439 7243. Paparoa Farmer’s Market — Every Saturday 9am– noon on the village green, Paparoa. Tangiteroria Tavern Car Boot Sale Gala Market Day — 1st Sunday of the month, $5 per car boot or stall. Contact Sheryl on 09 433 2802. Te Kopuru Market — 1st Sunday of the month, Coronation Hall, Te Kopuru. Ivy Vincent 09 439 1852. Ruawai Lions Club – Social meeting third Thursday of the month 7.30pm at Ruawai Community Sports Club. Info: Rosemary 027 2102008 or Secretary Dorothy 09 439 2557. Servicing Dargaville and surrounding areas. Specialising in domestic, commercial and rural installations and repairs. AVAILABLE AFTER HOURS MacJimray Septic Cleaning Services are the septic tank cleaning specialists in your district. Full Supply & Installation Service Carpet, Vinyl, Vinyl Planking, Wood Laminate Flooring, Stockist of 2m & 3m wide vinyl and Carpet Short Ends. Residential & Commercial Q Card Finance Approved. 6–18 month terms. 6 Mths interest free. Don’t let your septic tank become costly - service it now! Fridge/Freezers, Dishwashers, Dryers, Cooktops, Ovens, Washing Machines. CARAVAN EWOF (and marine). Call your local inspector today at A+ Electrical Inspections and Security on 021 240 6764. DECKS, FENCES, all small building jobs undertaken, Baylys Beach based. Phone Ross for a free quote, NorWest Building & Maintenance, 027 412 0840. SUZUKI 4X4 Wanted to buy - parked, damaged or unwanted, Escudo Vitara/Grand Vitara. Ph Derek 09 439 7573. FOR SALE 3 July born wethers, 1 July born Suffolk ewe $120 each, ph 021 140 3438, cash only. FANNON’S NEW Season men’s shirts 100% cotton.. Moleskin trousers and jeans. Scarves, cheese cutters and thermals. Ladies woollen and cotton L/S polos. FANNONS, 52 Victoria Street Dargaville 09 439 8946. FANNON’S WILL be closed over Easter including Friday, Saturday and Easter Monday. Enjoy your long weekend everyone. Fannons for Menswear, 52 Victoria Street 09 439 8946. FRESH HOMEGROWN vegetables and herbs, see Paul at farmers market Dargaville on Thursday and Paparoa on Saturdays. HOBBYIST BEEHIVE, new split, young queen, new box and frames, good honey stores, $350, ph 09 439 7170 or 027 536 2595. HOT CROSS bun orders, last call Wednesday at Dinny’s Bakery, ph 09 439 5146. LEYLAND 255 tractor, Pearsons quick hitch front end loader, tilt transport tray 1800 x 1000, good condition, $6,500 O.N.O. Kubota rotary hoe R62, 2 metres wide, drive shaft plus 3 linkage, quick release, excellent condition, $2,500. Ph 021 0270 4894. MAX’S WOOL Shop. Great winter colours in store, wools and acrylics, 54 Victoria Street, open 9.30am - 4pm Monday to Friday, 09 439 6604. POP INTO Dinny’s Bakery for home styled hot cross buns, ph 09 439 5146. SUZUKI ESCUDO Vitara/Grand Vitara - car parts, WOF parts, 4x4 parts etc. Good parts, good prices. Ph Derek 09 439 7573. TREADLE SEWING machine in cabinet, $120 ono. ph 09 439 0682. For Rent HOUSE TO rent, Sea View Road. 2 bedroom, 1 bathroom, single garage, large fenced section. No pets. Insulated ceiling & floor, heat pump, $320 per week (includes lawns). Call 027 321 3321. SECURE UNITS for Domestic & Commercial use. Also workshop space available, best rates guaranteed. Ph 09 439 3075. dargavillestorage.co.nz. JORDANS PAINTING and maintenance, great rates, no job too big or small. Why do it yourself? I’ll do it Right! jordanspaintingandmaintenance@gmail.com 022 025 3081. Tree Services TREE REMOVAL, pruning, chipping & stump grinding. Qualified & Insured. Ph Scott 0800 468 9663 Arborcare Tree Maintenance. Pet Supplies PET DOORS – Cat Doors, Dog Doors for Glass or Timber – supplied and installed. Ph 027 275 0918 or 09 439 6458. Kevin Sowter or visit my website: www.windowanddoors.co.nz – Window & Door Services Ltd.
Property Maintenance ATS PROPERTY Maintenance & Repair. Fences & Repairs • Kitchen/Bathroom Fitouts • Waterblasting • Flooring Repairs • Decks • Windows & Latches • Plus much more. No job too small. Ph 09 439 8628. HOUSE WASHING, pressure washing, soft house wash, drives, paths, decks & more. Your local cleaning guy, ph Tony 022 311 8447. OFFAL HOLES 750dia x 5.5m deep with concrete lid with lift out hatch $465.75 incl GST. Ph Wals Holes 09 437 3936 or 021 932 225. WATER TANK Vacuum clean, Full tank OK, Waste no more than 1,000 litres. Ph Wals 09 437 3936 or 021 932 225. AUSTRALIA FRANGIPANI trees (hymenosporum flavum) limited stock $8.00. Eucalyptus silver dollar $4.00, lomandra lime wave $5.00. Double white tree Dahlia $5.00. Got2go Plants 55 West Coast Road Te Kopuru, 09 439 5556. WINDOW & Door Repairs & Glazing, Insect Screens, Security and more – call me today. Ph 027 275 0918 or 09 439 6458. Kevin Sowter or visit my website: www. windowanddoors.co.nz – Window & Door Services Ltd.
Nurseries & Plants 2000 TREES, shrubs, ground cover, all ready now for Easter time planting. From $1.50 to $6.00, strong hardy West Coast grown. Clearance stuff $1.00, Tuesday to Sunday 10am to 4pm 55 West Coast Road Te Kopuru, 09 439 5556. Sorry no eftpos but internet banking availability. MAUNGI TANKS concrete tanks, built onsite and repairs, 021 138 6461. DARGAVILLE RIVERSIDE produce market, no market on Anzac Day Thursday 25th of April. THE JACKSON/PARORE/EDMOND’S whanau would like to thank the Northern Wairoa community for helping us celebrate the life of Celia (Hiria) Mei Parore. After her final epic road trip North, she was laid to rest at Te Houhanga urupa, Dargaville April 1st 2019. Survived by Dave, daughters Anne-Marie and Sam, her mokopuna Charlie and dog Tawhiri, she will be dearly missed. DUCK HUNTERS 60 Target Sporting Clay Shoot at NW Gun Club on ANZAC Day – 9am Start. $50 Entry Fee, Junior $40 includes BBQ Lunch. TARGETS ONLY but great raffles on the day. Refreshments & Ammo available. Ph 021 256 0696 for more Info. FOR THE last bake of hot crossed buns from Dinny’s bakery, order now, ph 09 439 5146. HORSE HANDLER coming to Dargaville soon, has been on Country Calendar. Want to learn more on handling young horses? Ph or text asap 021 209 3982. ACOUSTIC MUSIC Blackboard Concert change of venue — First Thursday of the month — 7.00–9.30pm, Kaipara Community Centre, Hokianga Road, Dargaville. $2 entry, $2 raffle. Performers and audience welcome. Ph Allan 09 439 6933 1or 021 439 697. ALCOHOLICS ANONYMOUS if you want to drink that’s your business. If you want to stop maybe we can help. Regular weekly meetings in Dargaville. Ph 09 439 5248 or 0800 228 6757. Situations Vacant RELIEF MILKER for dairy farm, must be reliable & good with all stock, ability to feed out silage, must have experience. Ph 027 439 5302. BOOKS@RUAWAI 5 Freyberg Road, Ruawai. Open during the School Holidays, Monday & Tuesday 9 -12 noon, Wednesday, Thursday, & Friday 2 - 4pm, Saturday 10am - 1pm. Closed on Good Friday. Ph 09 439 2044, 027 200 5653. NORTHERN WAIROA Country Women’s Club. All past members of the above club are cordially invited to attend our 60th birthday luncheon, Friday June 14th 2019 at the Lighthouse Function Centre. To register your interest please contact Shirley Andrews 09 439 8800 or email shirley.andrews90@xtra.co.nz. Friend & Partner to Heather, respected by Stephen & Michelle, Lynette & John Brisbane & their families. Friend to Alma. Gone hunting & fishing. On April 8th after a long illness. Loved Brother of Margaret & the late Richard McNamara, Colleen & the late Basil House & the late June. Uncle of Michael & Paula Warren & Helen Evison. At rest, aged 79. MONSTER GARAGE SALE! Saturday 27th April 8.00am. Old Grain Store, Beach Road. 3:00pm to 10:00pm Any objections to this proposal should be in the hands of the Kaipara District Council no later than 4.00pm on Monday 29 April 2019. Olive Patricia Taylor Much loved Sister & Sister in law of George & Etha, loved Aunty of Susan, Kevin & the late Christopher. Funeral notice later. April 18th Our dear niece and cousin went to sleep 1 year ago, only 55 years. Loved dearly. Rae & Family and Fay & Family. Peacefully on the 10th of April 2019 age 63 at home with her family. Dearly loved and treasured sister of Robyn, loved sister-in-law of Greg and dearly loved Aunty SheShe of Lara and Luke. So sadly missed. Forever in our hearts. LOVE REMEMBERS my Holy Sabbath, Romans 3 - 31. The application may be inspected during the ordinary office hours at the office of the Kaipara District Council Offices Unit 13, The Hub, 6 Molesworth Drive, Mangawhai or 42 Hokianga Road Dargaville. Any person who is entitled to and wishes to object to the issue of the licence may, not later than 15 working days after the date of the publication of this notice, file a notice in writing of the objection with the Secretary of the District Licensing Committee at Kaipara District Council, Private Bag 1001, Dargaville 0340. No objection to the issue of a licence may be made in relation to a matter other than a matter specified in Section 105(1) of the sale and Supply of Alcohol Act 2012. This is the first publication of this notice. Quality 2 bedroom Unit, short walk to town, built around the 1990s. This is a must view now as it is in a prime location. HRV System, ceiling fans, wall heater, laundry in garage, internal access, lovely sunny private patio area easy care grounds — what more could you want. Priced to sell now. There is a good tenant looking after the place well, wooden floors, aluminium and wood joinery, three bedrooms, insulated top & bottom. Has been relocated during 2004, big backyard (1101m2). Quiet country area, the tenant is happy to stay on. Up where you belong — All the work has been done for you, new carpet, lino, paint, vanity etc. Ready to move into now, great location with town views plus a conservatory, single garage and a garden area. Built in the 1970s with a 794m2 section. Great street, good neighbours. Vacant now! 1/3, 1/3, 1/3 financing option includes 1/3 deposit, 1/3 payment after 12 months, 1/3 payment after 24 months at a rate of 2.99%. Subject to proof of GST accreditations. Credit criteria, interest rate, fees, charges and Terms & conditions apply including an application fee and a dealer administration fee.